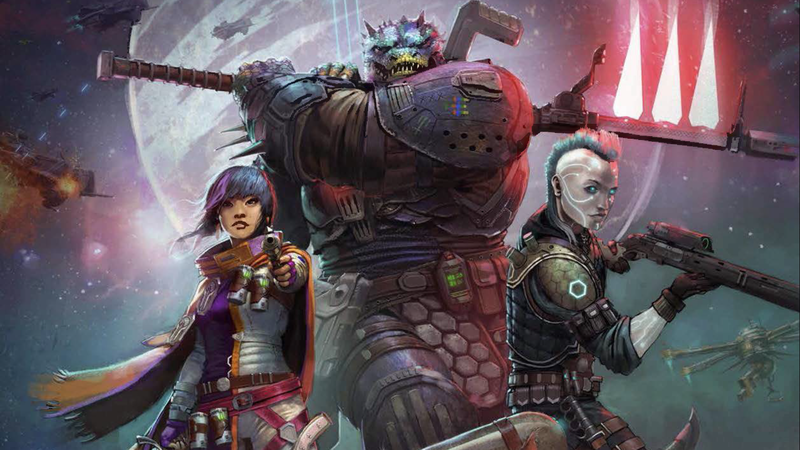 Starfinder brings us a galaxy of magic, mystery, and science fiction action, in what amounts to a fantastic update to the Pathfinder engine more than its own separate game. Starfinder is a clever product, but for none of the reasons you might expect. When Pathfinder came out it was answering a call to a world in need, dissatisfied with the radical shift in design of D&D 4th Edition. That time has long since passed, and with Fifth Edition remaking the marketplace, Pathfinder needed to change. However, with a year’s worth of books and a dedicated fanbase, Paizo would have had a revolt on its hands if it tried to release a new edition of the game. Enter Starfinder: effectively a new edition of Pathfinder masquerading as a brand new product. As a new science fantasy game the product ends up feeling unfocused. As a new edition of Pathfinder, Starfinder truly shines. The core book is a generous offering, boasting over 500 pages and containing a surprising amount of material. The layout has seen a serious upgrade from your average Paizo product, feeling every bit the science fiction tome it purports to be, but it’s really the art that sets it apart from its forebears. Long into the future, dungeonpunk has ceased to be vogue, but we can see its influences reaching out into the stars. Characters remain somewhat busy, but only to showcase the care and attention that went into their design. Not only characters, but action scenes, locations, planets, and a galactic map all brim with energy, wreathed in potential but surrounded by the dark unknown around. Far into the future of the setting, Golarion has vanished, leaving its wayward denizens to fend for themselves in the vast and wacky universe that now envelops them. The science fantasy setting never completely leans into weirdness, but its inspirations are clear. It evokes the classic Spelljammer if never quite reaching its same level of insanity. This style of old school science fantasy is seeing something of a resurgence of late (John Carter’s bombing aside), which also forces Starfinder to contend with a breed of game that Pathfinder could safely ignore: Edge of the Empire, Numenera, and Faith: the Scifi RPG all exist in the same space. Whether Starfinder beats any of them depends on whether you want something dedicated to Paizo’s design philosophy. The core of that philosophy is to make character building detailed and impactful, if primarily focused on combat. Character options in Starfinder consist of races, classes, themes, and optional archetypes if you want to add some more specific abilities. In some ways, the math surrounding all of these options has been pared down, but this being Paizo there remains a complexity that gives every choice weight, while making it a barrier for some players. The core races give us a good selection of roleplay and mechanical options, while there are a few bumps in the road. All of them are humanoid, keeping any from feeling completely alien, but my love of the weird should not bind the design team. Humans are repeatedly described as “the most adaptable” race, playing into a frustrating trope without giving human culture the backbone necessary for this to really work. Of course, this is a mechanical necessity, to give players a way to truly customize their characters. The Androids could have fit this niche well, being modular, except all androids are modeled off of humans, having been invented by them. Continuing with the Princess of Mars nods, Kathas are four-armed warrior poets who make their way deftly through harsh environments. Lashuntas are biologically dimorphic, each type with different bonuses, and both have low level psychic abilities. Shirrens are bug people who broke away from a massive devouring hive. They are now defined by individualism as a counterpoint, and the weirdness and lore of this race fills me with glee at the possibilities. On the other hand, Vesk are basically lizard Klingons. Their culture is about honor and fighting, which is as derivative as it sounds. Last and best, in my humble opinion, are the Ysoki, the scrappy and mechanically inclined space ratfolk. Each of these races work as you would expect, with a few attribute bonuses and a penalty, as well as some abilities to help round them out. Themes are completely new however, and function as a midpoint between backgrounds from 5E and Pathfinder’s archetypes. These are extremely welcome additions. Each has a +1 to a relevant attribute as well as abilities unlocked at specific levels. The first level is always relevant knowledge, while things get more advanced at higher tiers of power. There are still some strange bonuses floating around to make these themes more complicated than they need to be, but the basic principle is wonderful. With a little mechanical weight they give you a reason to consider your character’s motivations and backstory. Unless you want to play a Themeless, that is. Just like the Human, the point of the Themeless is to give players an extra opportunity to customize their characters, at the cost of being interesting. Its abilities provide the most versatility, while having the least theme attached to them. I understand why this was necessary, to give people options beyond what was already present, but I have a deep fear that this game of far flung space adventures will be overtaken by human Themeless characters because they are the best for math purposes. The seven classes in the main game are incredibly fun, consisting of the envoy, mechanic, mystic, operative, solarian soldier, and technomancer. Each are more or less what you would imagine from the name, except for the Solarians, which summon weapons and armor from stellar energy, and technomancers who use magic to enhance technology, and vice versa. The class system is the main place where Starfinder makes itself more approachable than Pathfinder. The extra complexity in some of the other areas is intended to compensate for how stripped down classes are now. You still have plenty of options, but they are no longer tied to confusing bonuses or ability triggers. Things feel much more straightforward, yet thematic at the same time. Each class also provides a few prebuilt class suggestions, to help you get into the game easier if you so choose. Skills still function as they always did, but the list has been modified to fit the science fiction setting. The only strange feature is that Medicine and Life Science are separate skills, and reading through their descriptions it remains unclear what the difference is meant to be. Many of these skills are tied directly into space combat, which gives them a fantastic extra utility. Starfinder is still a D20 product through and through. Most of the game is combat focused and the skill points still make for wonky probabilities. However, Paizo has made a few changes to help ease play along, and get rid of old annoyances. Iterative attacks and their associated charts have been eliminated, instead giving each character the option of two attacks, both at -4. Attacks of opportunity have three very distinct triggers, 5 foot steps are now distinct actions, and the action economy in combat has overall been simplified greatly. There are a number of feats which are taken from Pathfinder pretty directly, and while they lack science fiction flair they have all the mechanical weight to make them useful. Combat maneuvers and combat maneuver defenses are now gone, so those of you who liked maximizing them will be sad. One odd change is an extra Armor Class, or rather the splitting up of what is already there. You now have separate defenses against damage from energy and kinetic sources. While I am sure there is a reason behind this to help the game function, it is sure to confuse players with this huge new change to the dynamic of making a hit. Hit points have also been modified, taking a cue from the Star Wars Saga RPG. Every character has Stamina points, which heal fairly quickly and represent their ability to shrug off minor blows or deflect damage. They also have a much smaller pool of Hit Points, which represent the actual physical wounds they can withstand. Hit Points damage can be much more lethal, and is harder to recover from. This small change is extremely welcome. Every point of damage you take has extra weight. You are constantly moving closer to that critical line, keeping your eye on death itself. Some attacks target HP directly, making for a new brand of character builds and combat tactics. It is bolstered by the Resolve point system. Resolve points are a limited resource that recharge on a long rest. Each point has small uses, like rerolling a skill check, but most crucially allow you to heal Stamina points. This is Paizo’s first foray into metacurrency, but by putting its own tactical spin on Resolve points Paizo has successfully made them engaging, if not deciding to add flavor by tying them into roleplay. Equipment, after the passage of centuries, has seen incredible upgrades. Not only are the extensive pages of equipment impressive, but many of the basic items also have technological abilities to upgrade their capabilities. Not only do they have special damage types on top of their normal damage, they also have access to knockback, stun, and more, and the availability of these powerups adds the option of crafting as an attractive prospect. Some of these are based in magitec, using enchantments to create these new features. Unfortunately it is in the magic that equipment loses steam. Maybe it’s because of the power of technological innovations, but the book is frustratingly sparse on magic items. It has a few hybridized options in there, which present some of the cooler options for future supplements, limited though they are. Magic is no longer split into types, but which are available to the two casting classes: mystic and technomancer. While spells now only go up to 6th level, those classes have more martial options to supplement this blow to caster supremacy. Each magic class feels distinct, not only in their inherent abilities but in the spells they can access. Unfortunately, the majority of spells come directly from the Pathfinder core. Maybe magic has not changed significantly over time, but some different magical options to reflect the new space setting would have been appreciated. Once again, the math behind these spells has been made much more comprehensible. They are more user friendly than they were in their old Pathfinder days. Space combat and ship building rules are easily the most complicated portion of Starfinder, but it is also the most clearly intended for gamers who want to tinker with their games to make the best product. To build a ship, you first determine its tier, which gives you build points to distribute among frame, thrusters, power core, equipment, and locations such as med bays or research labs. The power core determines how many devices, like weapons and shields, you can have, which means you need to invest in this system. You will enjoy it if you do so, but it is a style of play that doesn’t appeal to everyone. For those that don’t, there are plenty of prebuilt ships for you to choose from. The space combat system works very well, incorporating many different character types into the action. You can take special actions each round depending on your position on the crew. The captain, for example, can inspire the crew to be more effective or taunt the enemy, while the science officer can change the heading or modify your tactics. At times, this can be very complicated, forcing you to manage sensors, momentum, and facing. Facing assumes that ships are meeting each other on the same plane, as ships have shielding in every direction except the top or bottom. I feel that many people will abstract these rather than dealing with the full rules, but for those that do there is something rewarding to uncover. The GM section is mostly a collection of useful tools. As you might expect, it contains traps, curses, diseases, story seeds, and the types of charts to help you get through the game. Monsters still have aggressive statblocks to contend with, which hurt their usability quite a bit. The setting section is, as with most portions of this book, filled to the brim with material. Planets, factions, and a loose history are splayed out to make damn sure that you come away with ideas to run with, and more than a few of them are fantastic. Much like Golarion before it, Starfinder’s universe eschews cohesion to make way for every story type you may choose to run. It will take a while for this setting to come into its own, but what we have already been presented with is a place in need of brave adventurers. Finally, Pathfinder Legacy contains rules for the older fantasy races and extensive conversion instructions. Frankly, I wasn’t able to go through the math well enough to speak to whether these conversions work well, but I would suggest players engage with this new game, rather than trying to continue on with Pathfinder. That said, the ability to bring everything from the original game (without having to pay for a new release of existing books) helps add to Starfinder’s value. While never devoting itself to the scifi concept it purports to serve, Starfinder shines as an update to Pathfinder’s mechanics. There are more than a few strange decisions in this product, but once you delve into the game and start strategizing around your character build you will be engrossed and deeply satisfied. ...while the core complexity will keep many players away.